Frequently Asked Questions - if you can't find an answer below please contact us and we will get back to you shortly. Standard or Winter Duvet or Deluxe weight? Most of our customers buy a combination! The Winter Duvet and Deluxe weight is perfect in those cold winter months and the chillier night in Autumn and Spring and the Standard weight can be worn all through Summer, Autumn and Spring. If you have two Snugbags (or more!) you will always have one available for when the other one is in the wash.
click here for a Bundle Deal :)! Standard Merino weight (tog 1-1.5) - ideal for all year round use. We recommend pyjama's and under layers from natural fibres preferably Merino. 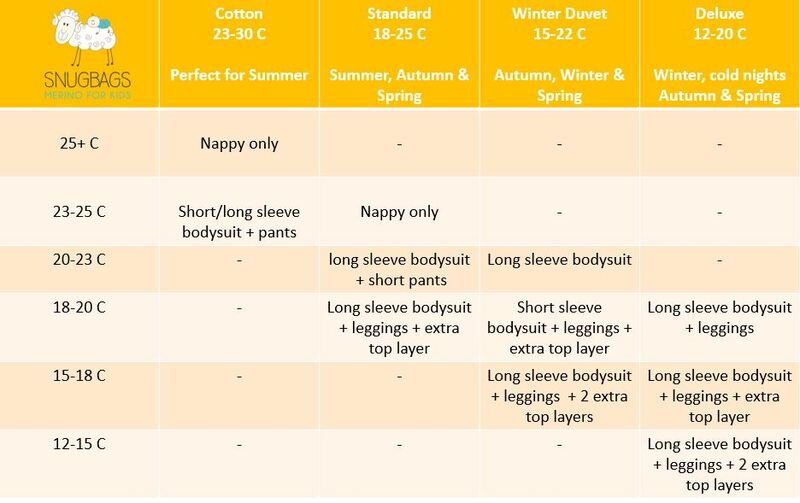 Please use our layering guide as a guideline - requirements may vary for different children. Merino is one of the safest fibre to dress your child in as it breathes and has the unique ability to regulate body temperature. Merino is the best possible choice of fabric to keep your child dry, at the right temperature, and sleeping sound all night. Being highly breatheable, Merino has a unique ability to create a micro environment over and around the skin. In both cold and warm conditions, it maintains an ideal temperature around the skin and releases excess moisture away from the body, keeping your child dry and warm without the risk of overheating. Merino is also extremely soft and gentle on the most delicate skins. The lanolin residue on the merino fibres is naturally anti allergen and prevents the build up of odours. The merino we use is produced locally. It is 100% natural and renewable. We highly recommend you do not buy synthetic sleepwear for your child. Although being attractive by price, any synthetic material such as polyester is uncomfortable and will not create the right conditions for your baby to have a good night sleep. It does not breathe and does not allow moisture to evaporate. As a result, your child will easily perspire and remain wet. They can either overheat dangerously, or get cold if the temperature goes down after they have perspired. Can I machine wash / machine dry my merino sleepwear? Yes, you can cold machine wash our products on a gentle cycle or hand wash with wool friendly detergent (preferably liquid). It is not recommended to put our products in the dryer. Instead, you can dry it quickly by hanging it over a heated towel rail. Your Snugbag doesn't have to be washed often. You can simply let it air inside-out over the cot rail and it will remain fresh for a long time. Please do not use bleach, fabric softners or stain removers. Please do not soak our product either. Always close zips when washing. Why should a baby sleep with a sleeping bag rather than just a blanket? From the age of 3 months, or sometimes just a few weeks after birth, babies will wriggle a lot and kick anything out of the way, even a tightly tucked blanket. To make sure baby keeps warm and dry, thus sleeping for nice long stretches through the night, it is essential to have them sleep in a quality natural fibre sleeping bag. As a result, baby will be well rested and content, and so will the whole family. A decent amount of rest is essential for being a happy family. What is TOG rating. What is the TOG rating of Snugbags? TOG is a measure of thermal resistance. It is used as a guide to know within what range of temperatures a garment can be used safely. Babies bodies are not yet able to deal with temperature extremes and overheating can be dangerous. TOG rating does not apply to natural fibre as there is no risk of overheating dangerously. However, we have added a 'Tog value' to make it easier for you to compare. Here is our temperature range recommendations to make sure your child is covered enough: Winter weight Snugbags: temperatures over 12 degrees (tog 2.5 - 3.5). Standard Snugbag: temperatures over 18 degrees (tog 1.5). Clothing under the Snugbag to be adjusted to the conditions. Can a newborn wear a Snugbag? Unless your little one is bigger than average, your baby will generally start wearing a Snugbag from 10-12 weeks old. Little babies love being swaddled as it mimics their time in the womb and it stops the startle reflex which can wake babies up. Our Snugpod is the easiest and safest way to swaddle your baby as it is the perfect swaddle every single time! No matter how often you pick baby up, feed her or put her down, she will stay securely swaddled. No complicated instructions and no bits of fabric to tuck away and come undone. Simply zip baby her pod and she is safe and secure no matter what.